Reaching out to our community and neighbors is grounded in the Sacred, we believe we each have unique and heartfelt gifts that we are called to share with others. In serving others shoulder to shoulder and through individual relationship, we serve ourselves, developing our compassion, and while providing hope and support to others in need as a way to fuel change. It is both an honor and a privilege to be able to do so. The blessing of Jesus always comes to us through the poor; the most remarkable experience is that, in the end, the poor give us more than they receive. The list below describes St. Paul’s yearly events. All of the events are open to the public. This is St. Paul’s largest fundraiser of the year! 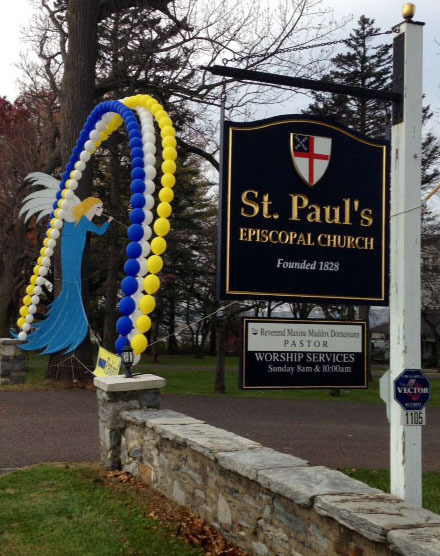 The beginnings of AngelFest date back to 1989 – known then as St. Paul’s Christmas Bazaar. Many changes and have been made over the last 28 years. Our annual holiday event was renamed “AngelFest” nine years ago. We kick off the celebration with the Preview Party the Friday night before the fair – a festive night with food, drinks, live music and the opportunity to bid on Auction items. A sneak peek of Saturday’s shopping treasures is also included. On Saturday morning AngelFest is open to the public – people are standing in line! Included are the Boutique Room, Grandma’s Attic, the Holiday Room, the Photo Booth, Baked Goods, Soup-to-Go, Quilt Raffle and refreshments and much more! Many dedicated members of St. Paul’s contribute to make AngelFest bigger and better every year! A big THANK YOU to each and every person who helped make the 2018 AngelFest fair a great success! Pets are special to us. They can become members of our families, and they themselves are a special blessing in our lives. God first created animals and called them good, and then created humanity to live with wildlife. We were meant to live together in harmony! 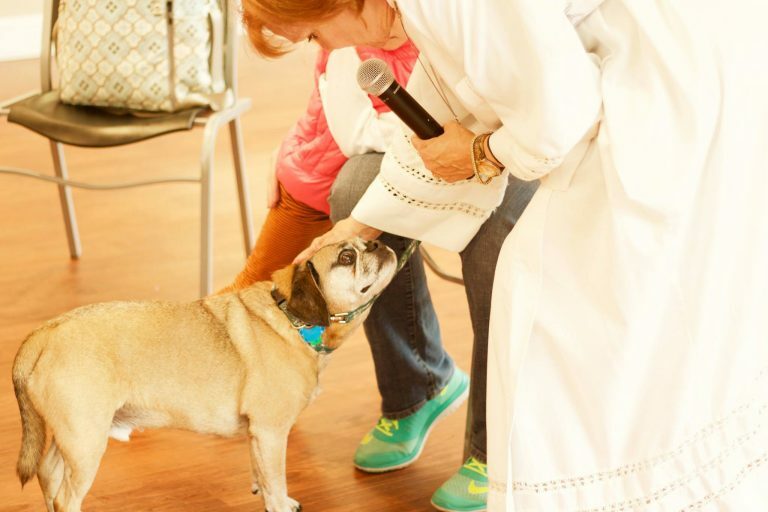 On October 7th, at 2:00 we will have a ceremony in honor of St. Francis giving thanks to God for the Blessing of our Animals – each animal will receive an individual blessing plus a “Blessing Certificate.” Please call the office in advance with your pet’s name. There will also be special treats for all of our special pets. 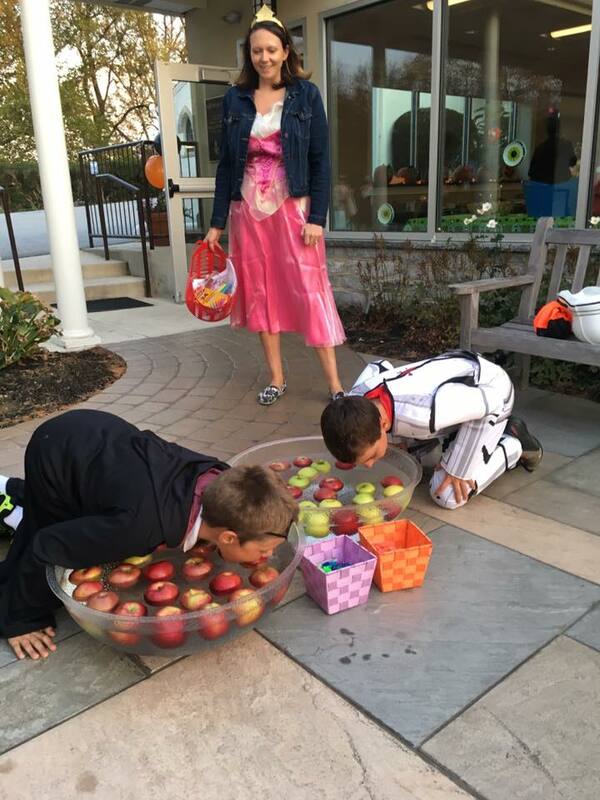 Our Halloween Carnival will be held on Saturday October 27 from 5 PM – 7 PM. Teal pumpkins will have peanut free treats! Included in the festivities will games, trick or treating around the campus, haunted rooms, a 6:30pm screening of It’s the Great Pumpkin, Charlie Brown and more! We need volunteers to decorate and help at the event in Getman Hall, as well as candy and food donations. If you would like to help out, please contact the church office or Liz Longua at liz@longua.com. Candy donations can be dropped off at the office during office hours. Join us for this night of spooktacular fun! Click here for the Halloween Carnival flyer! 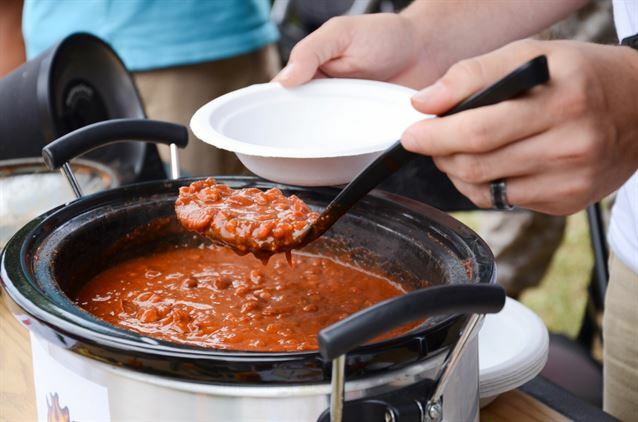 As the weather gets cooler it’s time for our Chili Cook-Off! Our annual event and contest to see who has the best chili made by our own St. Paul’s chefs. This year the event will be held on Friday, November 9th at 6:30 PM. Enjoy the latest batch of 24 Mile Ale available for sampling. This event is held the second Friday in November. At the end of World War I, citizens of the valley where St. Paul’s is located raised $595 and purchased a bell cast in Baltimore. 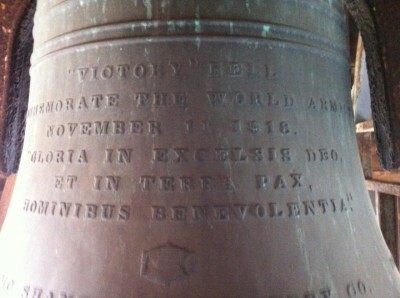 The names of 48 individuals in the Valley were inscribed on the bell, which arrived at the Church on March 29, 1919. We ring the bell to call people together to remember, to pay homage to what has gone before, and to move into the future together. On Sunday, November 18th at 2:00 PM we will again celebrate the leadership and sacrifice of the people of this valley. There will be a flag ceremony, a reading of the names inscribed on the bell, bagpipes playing and the ringing of the bell. Any descendants of the 48 persons whose names are on the bell will also be recognized. Everyone is invited! The Christmas Pageant is held during the 4:00 PM service on Christmas Eve. This is such a joy-filled event. The cast includes children and adults alike. Our children participate as angels and shepherds. The starring role as baby Jesus is given to an infant – always a sought-after role! The festivities also include a men’s choirs and of course the “Three Kings.” The Pageant concludes with everyone singing Silent Night in candlelight. This year’s Pageant is again under the direction of Donna Beard. the narrators will be working with Donna. Rehearsals will be after service on December 9th and 16th. Costume assignments will be December 16th. Dress rehearsal will be December 23rd. If you would like to include the name of a loved one in our Christmas Eve programs, please use the contact the church office by noon Wednesday, December 19th. A donation of $ 30 is requested to help defray the costs of the beautiful decorations that will adorn the church as we prepare to celebrate our Savior’s birth. Race day registration and check-in. 9:30 AM – 5K race followed by 1 mile walk/run. The 3rd annual Chrissy’s Run 4 Hope is a community 5K run in Exton, PA dedicated to increasing awareness of breast cancer, raising money to support cancer research, and raising the spirits of anyone whose life has been affected by cancer. 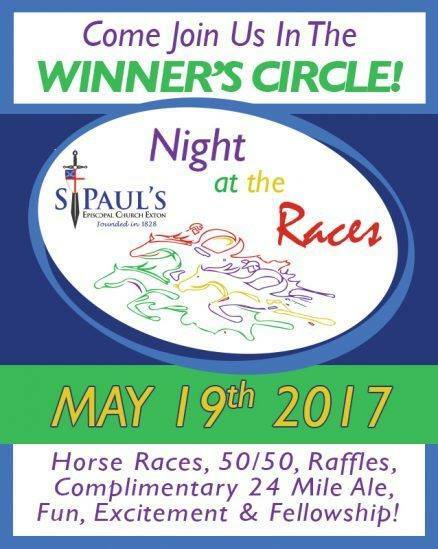 Wear your fanciest hat and come to our annual fundraiser – A Night at the Races, an event where actual races are shown to recreate the atmosphere of being at the race track. You can win big time! Check back for 2019’s date and time. There are 10 Schedules Races, Food, Beer, Wine, Best Hat Competition, 50/50 Heads or Tails Game! 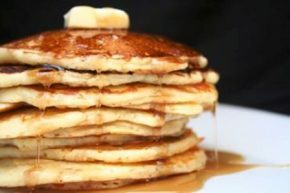 Shrove Tuesday officially ends the season of Epiphany with the season of Lent beginning the following day. 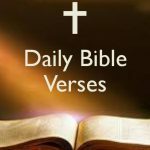 Held the night before Lent begins is a day of “fat eating” before the fasting period of Lent. Known as carnival day in Louisiana, the faithful would use up all their butter, sugar and some meats so they wouldn’t go to waste. We gather as a church family in Getman Hall to celebrate. A RACE FOR ALL AGES! St. Paul’s annual Great Zucchini Race is part of our summer celebration. This year we celebrate on Sunday, August 5th. We start the day with “Mass on the Grass” followed by the Zucchini race. Whether you enter as a contestant or to cheer on your favorite wacky racer, you’ll discover that vegetables are fun! Race cars are easy to make and just need your unique creativity! Please watch the video! Our annual summer picnic including a cook-out and yummy food is also included in this day of celebration. Please call the office for more information. Sunset Socials in the Community Garden are held on second Fridays through summer. Bring your own chair, snack and beverage and join us at the garden for an evening of camaraderie, fellowship and a gorgeous sunset.